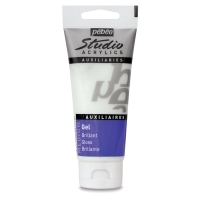 Pebeo Studio Acrylic Gel Mediums offer artists unlimited creative possibilities. The technical and plastic qualities of each medium let artists create new materials and textures. Gloss Gel has a similar consistency to that of Pebeo Extra Fine Acrylics. 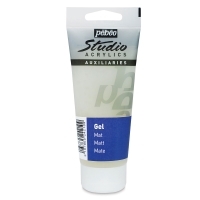 Mix Gloss Gel with Extra Fine Acrylics to increase transparency and depth. It also supports all collages and inlays, and it's bright and transparent after drying. Make it more fluid by diluting it with water or mixing it with a medium.